AI and customer service; it’s a hot topic! But when I talk to customers, they say, “I get there’s something to AI and customer service, but how do I deliver business results and value with AI?” If you are wondering how AI can move the needle on the metrics you get measured on every day, below is a short guide on how to get the best business results when considering AI as part of your Customer Service strategy. With that information, you can begin to strategically decide how to use AI to transform your customer service operations and KPIs, positively impact customer and agent experiences and directly affect your bottom-line. These dedicated resources are expensive and difficult to find. And AI development is not the core business focus of a contact center. The result? Wasted time and money and longer time-to-value. When choosing an AI solution, look to see how much work is required on your end to implement a solution. To make AI intelligent, all systems require some work. The question to consider is how business/user-friendly is the application? Do you need to hire a team of AI and UX specialists to get benefits in customer service? Or can you deploy the AI quickly and get back to focusing your efforts on delivering amazing agent/customer engagement? Data. Data. Data. AI is all about the data. So, consider where the data in customer service resides. The customer record data lives inside the CRM platform. And the customer interaction history lives inside the customer service application. Since AI is only as good as the data it interacts with, look for an “AI-inside” solution; one where the AI is built into the CRM platform and the customer service application. AI is already integrated into the CRM platform and the customer service application. What does this mean to you? Faster time-to-value. With an integrated solution, AI can easily learn from the customer data to deliver contextual customer/agent answers. So, whether you are delivering self-service or agent-assisted service, intelligent AI service is satisfying service. How many times have you wanted to change something in your customer service application, but don’t because it’s so difficult — even though it would transform the agent/customer experience? This is where using an agile platform and application leads to faster, better business results. As you are considering adding AI, ask yourself, “How quickly/easy is it to make changes to the AI solution, as well as to the agent and self-service application?” Look for a drag and drop integration layer that allows for easy configuration of process flows to set up customer service AI. This way AI isn’t some futuristic “ideal” that sounds good when you say it fast but in reality, it takes forever to drive business results. Consider choosing an integrated AI customer service platform/application that is agile – so you can make changes on the fly to quickly deliver on the brand promise of great customer experiences. And while this step is listed last, it may be one of the most important. Why? New technology often becomes “shelfware,” i.e., technology that is owned or licensed but not utilized because it’s difficult to implement, use or change. A solution with a prebuilt UI/UX interface makes the customer-facing interaction intuitive, which builds trust, so customers use it. The last thing you want is a throwback to “bots of yesteryear” that didn’t have the advantage of AI or a poor user-interface. If customers can get their answers using a bot, call and email volume will be reduced, while delivering a great experience. And for the agent? Key to great service is empowering agents with the best possible tools. AI integrated into the agent desktop and console classifies cases and identifies key information needed to serve the customer even before the agent gets the case. And then enables the agent with the best possible next actions. AI is not meant to replace agents, it’s meant to empower them to deliver exceptional customer service. The most important thing to take away? When considering AI for customer service, focus on what you do best, delivering great experiences. Avoid choosing systems that require you to become or hire a bunch of rocket scientists. Choose a solution designed to allow customers to easily get the answers they need on their own, your agents to intelligently engage with customers and for you to deliver business results that matter. 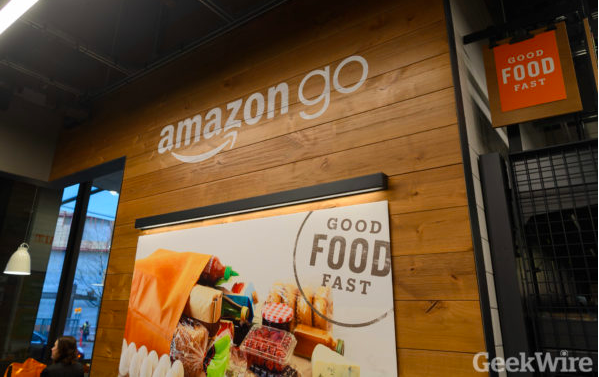 Amazon: New Amazon Go Stores and Headquarters! What if a store had no cashiers or cash registers? 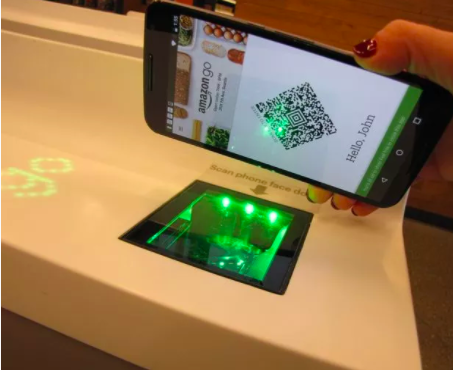 What if at the entrance, there were turnstiles and you had to scan your smartphone upon entering the store? What if you didn’t need cash, credit cards or checks? That’s what the new Amazon Go stores are all about! 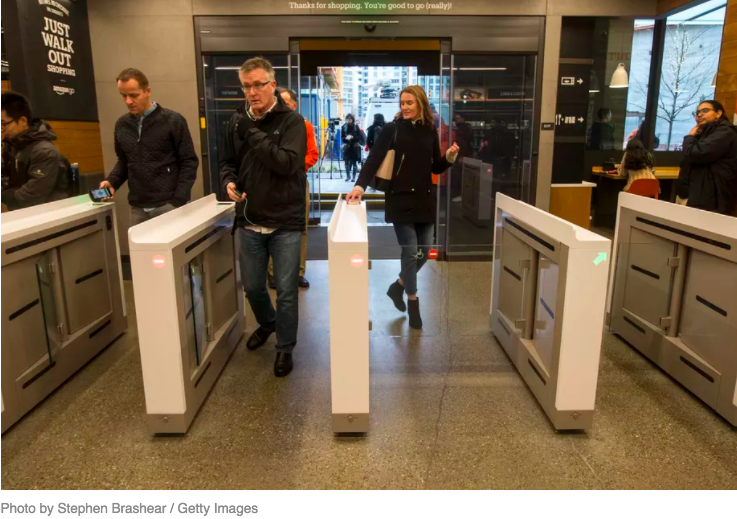 You check in with your Amazon Prime Account at the turnstile using your existing Amazon credentials to log in to the Amazon Go app on your smartphone. When you finish shopping, the receipt for what you bought is sent to the app once you leave the store. And if you were wondering if Amazon is linking Amazon Go with Amazon.com online, the answer is not yet. So if you pull an item off a shelf and replace it because it wasn’t what you wanted, Amazon isn’t currently showing you an ad for a related product the next time you’re online. Could be something they could do in the future? Perhaps. But there is a reason you put it back on the shelf. And that reason may not be apparent and thus may not warrant remarketing it to you. This Amazon Go Store, at 2131 7th Ave. in Seattle, and is open from 7 a.m. to 9 p.m. Monday-Friday. Amazon needs a second headquarters. Why? Because it’s bursting at the seams in, Seattle. This is where Jeff Bezos founded the company in 1994. Amazon has transformed the city, employing more than 40,000. The downside is that expansion also contributed to Seattle’s soaring cost of living and its traffic woes. And where might the new headquarter of Amazon be? Fourteen of the 20 were in the Eastern time zone. The shortlist of cities included: Atlanta, Austin, Texas, Boston, Chicago, Columbus, Ohio, Dallas, Denver, Indianapolis, Los Angeles, Miami, Montgomery County, Md., Nashville, Newark, New York, Northern Virginia, Philadelphia, Pittsburgh, Raleigh, N.C., Toronto and Washington according to the New York Times. This list was narrowed to these 20 cities from the original 238 cities that sent proposals with unique offers and incentives. Amazon plans to invest nearly $5 Billion dollars and create up to 50,000 jobs for it’s newest hub. This made many cities desire to be among those chosen. 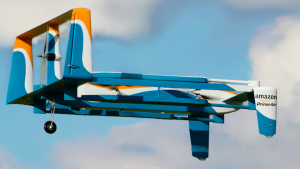 Amazon asked contenders to tell them detailed information, including tax incentives available to offset its costs for building and operating its second headquarters, potential building sites, crime and traffic stats, nearby recreational opportunities, proximity to an airport, public transit, diverse demographics, connectivity and good, local schools with that could provide great potential employees. The firm, Sperling BestPlaces, has good track record with prior picks, getting 15 of its top 20 picks that made Amazon’s short list, which included the top 11. According to Tech Crunch, the new Amazon Headquarters will likely bring $100,000 to the winning market over the next 10 to 15 years. In addition, they predict the chosen city will also benefit by a trickle-down effect as Amazon employees may start their own companies in the future, spurring more new growth for the city. Cities that were picked received a short note from Amazon, letting them know Amazon wants to continue to learn more about the city’s community, talent, and potential real estate options. Amazon said as they reviewed all the proposals, they learned about many new communities across North America that they may consider in the future. The selection process, according to the New York Times included economists, human resources managers and executives who oversee real estate. Where will the final Amazon Headquarters be? What’s your guess? I was working for a company that had found themselves in a situation where they had poor morale. Raises were few, partially because of the economy and as a result, people were working very hard and not feeling appreciated. HR came to me to ask what to do. As an early design-thinker, my reaction was always to ask the “customer.” In this case, the “customer” was our own employees. When I interviewed them, I asked them what they wished they had- essentially what was missing? I found that the answers were very surprising. They didn’t feel appreciated. They didn’t feel they were growing and expanding their skills. They didn’t feel like they had a future or that the future looked bright or that they had a hand in creating that future. Or that they even mattered. I found that in the appraisal process, once the employee heard they were not getting raise, they shut down. So pretty, much after the first few minutes of the appraisal, they stopped actively participating. So when it got to the part where they were going through their goals for the next year, they had stopped engaging and were only going through the motions. Because their future goals and engagement to their jobs and their careers was key to being a top company, I came up with the idea of separating the employee appraisal process from the employee development process. And set out to design an employee development process where employees could examine, through goal setting practices, personal-professional goals that would enhance their skill set and make them more valuable to the company, but also have a personal sense of accomplishment and growth. The Cost of Low Employee Morale? The cost? With my team, we estimated about $6M for 60,000 employees. I went to the executive leadership meeting and presented my proposal. There was a lukewarm reception, that is… until I got to the cost. At $6M I was laughed at and told to sit down. That was the longest meeting I have ever been in. I couldn’t wait for it to be over. Trying my best to hold back the tears, I just sat there feeling awful. I went home that night and I did cry. I had interviewed the “customer” figured out what was missing and proposed the solutions. But what I didn’t do is calculate the return on the investment (ROI.) This was very early in my career and this experience taught me the valuable lesson of creating the business value or business case of whatever it was I wanted to propose. The lesson served me well because once I learned to do this, I always got my funding. They said, combining the recruiting teams time, traveling to various universities, ads in the local papers, radio advertisements, (This was way before social media) reviewing incoming resumes, having the initial screening calls, and then interviewing with a number of the staff and the hiring managers, getting the engineer a secret clearance, etc… the cost was about $150,000 / engineer. And then I asked the crowning question, “How many engineers did we lose in the last month?” HR said, “200.” And I saw the ROI. If we had lost just 40 people, then $150,000 x 40 would equal the $6M I was asking for. But in the last 3 months we had lost 200, so the cost of attrition just for 3 months was $150,000 x 200 = $30M. So with the loss of 200 engineers, if I could retain half of them, 100 engineers, then the cost of attrition would only be $15M. The benefit is the saving of the $15M in attrition costs. The cost is the cost of the program or $6M. So after pulling my self together and confident with my calculations, I asked for 5 minutes on the agenda. Of course, they were reluctant to give me any time. I got 2 minutes. So I went in with one slide. The slide with the ROI calculation. I said, “We are spending $30M in attrition and if we pay attention to why people are leaving and create a better culture so people feel that they matter, they are learning and growing and feel apart of something bigger than themselves, we can reduce that attrition. So let me walk you through the calculation….” And I did. To my surprise, instead of sighs of ridiculousness and grumpiness, there was silence. I had hit upon something that no one had thought about. The cost of attrition. While is at first seemed like a “soft” cost, when it was laid out for them in black and white… even if I was off by 50% – we were still wasting the companies money on having people leave because we weren’t paying attention to what was important to them to feel loyal. Why go through all the time and expense to recruit these amazing people, only to push them away and have them go to our competitors, making our competitors smarter and stronger? Actually very well. I was given the money to develop the employee development program. I was very surprised to get so many emails and people stopping me in the hallways to tell me how much they appreciated what I had done. I didn’t do it for the accolades. I did it because I truly wanted to create an amazing place to work. The lesson learned? If there is value to something, even if it feels like it is initially a “soft” cost, there is a way to express it in hard dollars in a way that executives can see change is needed. And this was my first experience in organizational change management! Reducing attrition of talent you want to keep to make sure you are able to produce the best possible business results. Reduce customer churn by increasing customer satisfaction by better customer experiences and hence increasing customer retention…. Why Do Company’s Fail At Digital Transformation? Smart leaders need all the efforts of all their employees, as well as, feedback from their customers so they don’t fall into the digital transformation failure chasm. However, often times they are so busy doing what they have always done, they they might not see a new way of looking at things. That’s where another pair of eyes or hands or even a team can help. You’ve experienced this probably yourself. You are trying to solve something. You feel you’ve looked at it hundred different ways and nothing really new comes about. You might even show a friend or a team mate and they are stuck, too. Why does this happen? You are not alone. In fact, it’s quite common. 1962, Abraham Kaplan, then a Professor of Philosophy, was giving a speech to scientists in which he urged scientists to carefully consider their methods for their research. He emphasized that – just because certain methods happen to be handy, or one has been trained to use a specific method or trained to look at a problem from a certain perspective -it doesn’t mean that that method will produce the best outcomes. Sometimes people formulate problems that reach solutions by using those techniques they are especially skilled in. In other words, we tend to formulate our problems in ways that make it seem the solutions to those problems demand precisely what we already happen to have at hand. In Abraham Maslow’s The Psychology of Science, published in 1966, stated, “If all you have is a hammer, everything looks like a nail.” The issue is the reliance or over-reliance on the familiar or the habit of using the same perspective. Taking this concept into software development and implementation, José M. Gilgado, wrote a law that is still relevant and highly applicable in 21st century. He observed, often times software developers and implementors, “tend to use the same known tools to do a completely new and different project with new constraints.” Why? They blamed it on what he calls the comfort zone, a state where we don’t want to change anything to avoid risk. What’s the problem with using the same tools every time? We get good at those tools and we like using what we are good at, right? The issue can become that you don’t have enough diversity when discussing the problem (because you are using the same perspective you’ve always used) so the exchange of diverging or opposite views is limited and the choices to look at the problem from different points of view are limited because there’s nothing new to compare it to. What would be better if is… to look for the best possible choice with varying perspectives, even if we aren’t very familiar with them. But we rarely do that. Rather, we fall into group-think. There’s some very interesting research by a professor at the University of Michigan, Scott E. Page who studies complexity theory. In his book, The Difference, he shows how the power of diversity creates better groups, firms and business outcomes. We all differ in how we see and interpret the world. How we code things is our “perspective.” Scholars from a variety of disciplines have studied how people and groups make breakthroughs. The bottom-line? Encouraging and working with diverse perspectives. For example, do you know how pins came to be manufactured? Adam Smith ran one of the first brush factories. Someone saw that the bristles could be cut off and made into pins. That’s what I mean about seeing things differently. Most people would have looked at a brush factory and saw a brush factory. But the first pin factory was imagined by seeing that diverse perspective – seeing the world differently – seeing the world as a forest of pins – provided the seeds of innovation. Adopt new technologies faster to keep pace with change. Sparking agility throughout the organization, igniting the whole culture’s motivation in whole new ways, giving them a renewed sense of purpose and outlook on the future and feeling they have the dream job and a reason for showing up other than a paycheck! Continuing the processes required to innovate, iterate, pivot and grow. How do you find such a group? Look at their DNA. Is it digital? Are they a natively global, mobile, social, cloud, community-oriented company? Are they trusted advisors who put the customer first and teach them to fish? Do they experiment, try new things, iterate and pivot quickly when it doesn’t work and tweak things till they hum? Do other companies desire to be like them and wonder what technology they use to be so innovative and wonder how is it, they do what they do? Are they super customer focused? As my friend and colleague, Peter Coffee would say, “Do they create a sense of urgency, hope and glory? Or conviction, belief and desire in your team? Are they all about (and seriously about this, it’s not just some words on a website or a brochure) connection, collaboration and innovation?” If you want to learn more about how one group guides business through digital transformation, here’s more info on that! Until next time, here’s to realizing your vision and the best possible future for your company, your employees, your stakeholders and the planet. It’s all of our jobs to make the world a better place. And what better place to do that than starting with businesses? That’s where people spend a great deal of their time! So make it a fabulous experience for employees and the customers will feel the love. You will be their go to source for all your customer’s products and services. Don’t give them reasons to leave you, Give them reasons they can’t possibly give you up. Because… at the end of the day, that is what drives customer lifetime value. No customers, no business. It’s really that simple. Want to Know More About Machine Learning and AI? Wondering whether you should invest in AI and Machine Learning? That’s a question that the most innovative companies are considering. Why consider it? One good reason is because your competitors have already started. If that doesn’t give you some reason to get motivated, I hope you get started before you are put out of business. To make sure that doesn’t happen, there are a few things to consider to help you start to explore an investment in machine learning. Of course, as with any business initiative, you’ll want to create value. And this can be done using machine learning systems. But for those systems to provide value, companies will need to begin by evaluating their organization’s data maturity, but more importantly their readiness to accomplish its data-driven goals. Company’s need to start with an audit of their data warehousing, data scientific research capabilities, data governance and data hygiene. In addition, it’s important to look at the sources, uses, volume, and veracity of all your date, meaning your first-, second-, and third-party data. Why is making sure your data so clean? Machine learning is basically taking a computer and making it smart enough to learn from the data it’s fed. We are essentially programming machines to learn. The goal is that after a certain point of time, the computer is able to predict further data. How so? Let’s pretend you want to make your computer predict the weather. So to begin, you might feed the computer weather reports of every hour of every over the past year. What you might end up with is– because the temperature (z) depends on day of the year (x) as well as the time of the day (y), more than two-dimensional curve. In fact, weather is random, so the equation generated by the computer won’t just have 3 variables (x, y, z), it may also have higher powers. So depending on the number of factors in a prediction and the randomness of the outcome, the complexity of the curve can increasingly get more complicated. So back to the data… And I know you know the story about data: garbage in, garbage out. So hopefully, now you see can why good, clean data is so important to prediction. As the computer is taking the data you feed it to make future predictions, those predictions dependent on the data you are feeding it. So you want the very best data possible. And it takes super computers which are capable of handling large volumes of data, as well as the ability to learn fast and to make fast decisions based on the learning it under goes. Often times Artificial Intelligence (AI) and Machine Learning (ML) are used interchangeably. But they are actually different. Artificial Intelligence is the broader concept of machines being able to carry out tasks in a way that we would consider “smart.” Machine Learning is the application of AI based on the idea that we should be able to give machines access to data and let them learn for themselves. Artificial Intelligence devices (devices designed to act intelligently), are often classified into one of two groups: 1) applied and 2) general. Applied AI is far more common. Applied AI is about systems designed to intelligently trade stocks and shares or drive an autonomous vehicle. Generalized AI is may up of systems or devices that, in theory, can handle any task. And are less common. However, this is where some of the most exciting advancements are happening today. It was introduced with the objective of moving Machine Learning closer to one of its original goals: that of being Artificial Intelligence. So essentially Deep Learning is a subfield of machine learning concerned with the algorithms inspired by the structure and function of the brain called artificial neural networks. Deep learning has worked it’s way into business language via Artificial Intelligence (AI), Big Data and analytics. Deep learning is an approach to AI which shows great promise when it comes to developing the autonomous, self-teaching systems which are revolutionizing many industries. Arthur Samuel, in 1959 is credited as the one who came up with the big idea that it might be possible to teach computers to learn for themselves. That would be in contrast to teaching computers everything they need to know about the world and how to carry out tasks. The second big idea was that the Internet, with huge increase in the amount of digital information being generated, stored and could be used for analysis. So the scientists and engineers realized it would be far more efficient to code computers to think like human beings, and then plug them into the internet to give them access to all of the information in the world. Neural networks are a set of algorithms, modeled loosely after the human brain and designed to recognize patterns. The development of neural networks has been key to teaching computers to think and understand the world in the way we do, in addition to the innate advantages they hold over people such as speed, accuracy and lack of bias. So a Neural Network is a computer system that classifies information in the same way a human brain does. It can be taught to recognize, for example, images, and classify them according to elements they contain. It works on a system of probability – which means that based on data it’s fed, it is able to make statements, decisions or predictions with a degree of certainty. The addition of a feedback loop enables “learning” – by sensing or being told whether its decisions are right or wrong and then can modify the approach it takes in the future. What Can Machine Learning Applications Do? Machine Learning applications can read text and work out whether the person who wrote it is making a complaint or offering congratulations. They can also listen to a piece of music, decide whether it is likely to make someone happy or sad, and find other pieces of music to match the mood. They can even compose their own music expressing the same themes, or which they know is likely to be appreciated by the admirers of the original piece. Take Google for instance. Google is using it in its voice and image recognition algorithms. It is also used by Netflix and Amazon to decide what you want to watch or buy next. And it is also being by researchers at MIT to predict the future. While Machine Learning is often described as a sub-discipline of AI, we might look at Machine Learning as the state-of-the-art of AI. Why? Perhaps because it is showing the greatest promise to provide tools that industry and society can use to drive change. More on the practical uses of AI and ML in the future. For now, noodle on that! Vending Machine Are Not Just for Chips and Soda: An Innovation for Displaying Luxury Cars? If you thought vending machines were just for fast food, think again. They are now for fast cars. From a Singapore “vending machine” you can order Bentleys, Ferraris and Lamborghini’s. How does it work? Well if you are in the market for a super fancy car, you can stand on the ground floor and with a touchscreen choose the car of your dreams. With an advanced system that manages vehicle retrieval, the car arrives within one to two minutes. Gary Hong, general manager at Autobahn Motors, said, “We needed to meet our requirement of storing a lot of cars. At the same time, we wanted to be creative and innovative,” he told Reuters. He has been approached by developers interested in using the company’s Automotive Inventory Management System for parking services. But they aren’t the only ones. In fact, U.S. company Carvana uses vending machine-like towers to sell used cars. March marks the month it opened an eight-floor structure holding up to 30 cars. The Carvana vending machine, is a coin-operated. The proprietary Car Vending Machine offers a unique pick-up experience for customers who purchase a car online through the company. How does it work? Carvana customers search for and then buy their car online at Carvana.com using — you guessed it – a mobile phone or desktop computer. Not only can customers buy the car, but they can also choose the vehicle financing through Carvana and even have the option to trade-in a car. Once the purchase is complete, customers can choose to have their car delivered directly to their door or they can elect to pick it up at one of Carvana’s Car Vending Machines. If they choose to come to the vending machine, at the time of pick-up, the customer receives an oversized Carvana coin to drop into the custom coin slot at the at the car Vending Machine. The purchased car is automatically retrieved from the tower and moved through the machine until it reaches a delivery bay. There, the customer gets to drive away! Where will the next source of innovation come from? You never know these days! Read the original article on Reuters. Copyright 2017. Digital Transformation Projects Have an 84% Chance of Failure; Are You Ready to Failure or Succeed? Would You Invest If You Knew the Investment Had a High Likelihood of Failure? If I were to tell you that I had an investment opportunity for you and the probability of you making money was 16% or less, how likely would you be to invest in it? But if I told you that the investment opportunity had a 90% chance of returning your investment, might you be more likely to want to invest? What’s interesting is that digital transformation is all around us. We can’t help but be impacted in our person lives, from smart phones, smart TVs, apps (think taxi’s vs. Lyft), Siri, Alexa and Google Home. In business, it’s clear that customers want to engage with business in digital and mobile channels. Businesses need to make the transition to be competitive and survive. Yet according to Consultancy.uk* and Bruce Rogers** who wrote Profitable Brilliance: How Professional Service Firms Become Thought Leaders, 84% of businesses undergoing digital transformation are likely to fail. Things that make you go hmmmm. The more things change, the more they stay the same. When Will Organizational Change Management and Culture Change Be Taken Seriously? The stats show since the late 1990’s – early 2000’s until now, when Culture Change (CC), Organizational Change Management (OCM) and Behavioral Change (BC) is missing from a project, there are issues, yet it’s still not “fashionable.” Perhaps the lack of fashionability is from an old paradigm stemming from the command and control type leadership that doesn’t deem people as an important aspect of the business transformation, whether its CRM, ERP or Digital Transformation. Perhaps it stems from leadership that doesn’t know there’s a whole science and set of CC and OCM methodologies that go along with IT implementations. Perhaps they have never been shown the value of that OCM and CC can bring, so they still don’t think it’s important enough to invest in. Perhaps it’s a matter of showing people that it works and makes a difference! Organizational readiness and adoption on a continuing basis of the ongoing changes. And of course, underneath each of these very simplistic groupings is a deep set of assumptions, tools, methodology and business-driven outcomes. So digital transformation isn’t uniquely about technology. It is about having the right digital strategy to ultimately transform a business to achieve higher objectives. This type of digital transformation must be built along with the human capital component, including skill sets, as well as, a cultural adoption of changing the way we do business. So what it boils down to is evolving behaviors within the organization, both from a leadership point of view as well as middle level managers to all employees. What is seems like, referencing one of my favorite people and author’s is Geoffrey Moore. It’s seems that perhaps we are, after twenty or more years of having OCM and CC at our finger tips, we are stuck in the adoption chasm. What we are headed for is the digital transformation iceberg of failure. We know what the iceberg did to the Titanic. We don’t want to be on a sinking ship. So what does an organization need to do? More on all of this in a future post. Is Organizational Change Management Just the “Fluffy Stuff” or Is There Real Business Value? Is OCM and CC Kumbaya? When I first lead organizational change management (OCM) and culture change (CC), it was at previous high tech company; a company made up of mainly engineers. When the topic was first announced as part of our integrated product developed process (a.k.a. teaming) it was labelled very quickly as “apple pie and motherhood.” Many thought we were going to sing Kumbaya or I was going to bring cake and cookies to meetings. What I learned was framing what the results could be and by providing individuals, teams and organizations, with tangible results, I found being outcomes-driven was the missing key. How so? When I framed OCM and CC in terms of outcomes and business value, I asked questions like, “Would you like it if everyone showed up to your meetings? On time? With the action items completed? With a proactive attitude vs “not invented here or we don’t do that – that way here” attitude… Get a high rate of return on projects- projects on time, within budget and scope, high customer satisfaction…? Of course the answer was a resounding “YES.” The employees were craving answers to these issues that plagued the organization. And no one knew how to fix these issues. They just persisted. People stopped taking deadlines seriously. They expected project scope to creep. Budget overruns were somewhat typical. When I was able to explain the value of the outcomes of OCM and CC to them personally and their teams- the WIIFM (What’s in It For Me), they became extremely interested as the cultured suffered from too many meetings, people always in meetings so they never had time to do their action items; a passive-aggressive culture- so instead of coming to the meeting (without the action items completed and saying they didn’t have time and figuring out how to change something so they did have time) they just wouldn’t show up… And in that company – one team’s action items directly impacted another. For instance, if team 1 didn’t finish their action items teams 2, 3, 4… couldn’t do theirs… and the project fell behind, out of scope, over budget… It was a horrible domino affect that one one really knew how to fix. Giving orders that projects needs to be on-time, within budget and on scope didn’t really lead to change. It just lead to frustration because there were reasons why those things were happening, but giving an order that they needed to be done didn’t fix the root cause. So nothing changed. And of course having a methodology and tools that help teams and people make those changes… takes it out of the “fluffy stuff” and into the business realm. OCM and CC is so much more, but people don’t know, what they don’t know… so it’s key to have a concrete methodology so it’s taken seriously and it can add business value to teams and our customers. More on that in future posts.